In Turkey’s increasingly repressive media environment, where journalists may be arrested for criticizing President Recep Tayyip Erdoğan or officially forbidden from covering certain stories such as this week’s suicide attack in Istanbul, satirical magazines are nevertheless forging ahead. And while most of them–Leman, Penguen, and Uykusuz, for example–oppose the government from the left, there are also a few right-wing publications contributing to healthy debate through cartoons and subversive columns. 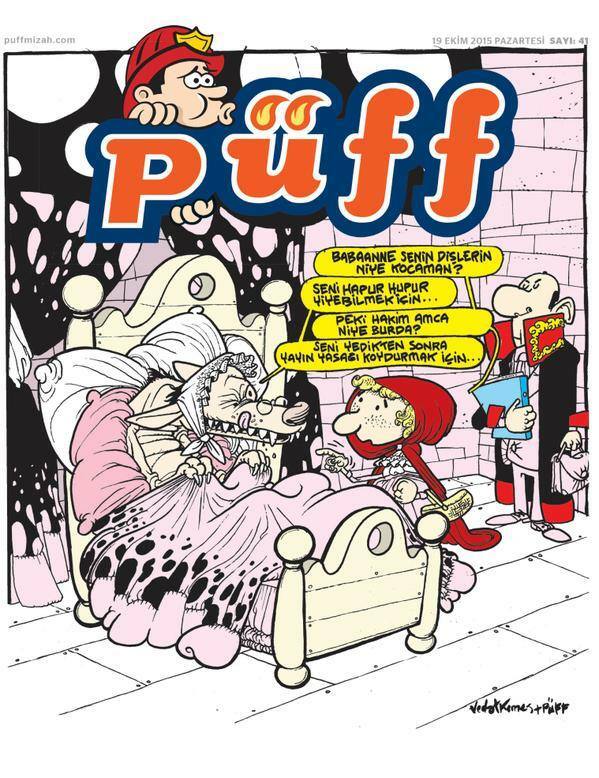 An article by Kaya Genç in the most recent Index on Censorship profiled the newest one, Püff. Once an ally of Turkey’s current government, the movement has become its fiercest critic. Nowadays its members are accused of “plotting to topple the elected government”, for which they are being subjected to terrorism charges in Turkey. We always discuss between ourselves: ‘Is this joke a bit too much? Are we really mocking a situation here or are we just trying to hurt the politicians?’ Some of our readers ask us whether it is not disgraceful to picture statesmen the way we do in our cartoons. Maybe it is a bit disgraceful, yes. But it is a necessary disgrace. Genç’s four-page article about Püff can be found in Index on Censorship’s latest issue on the theme of taboos around the world. The content is behind a paywall, but may well be available through your friendly local library’s online databases!